For many years, a group of California winemakers have been practicing a fermentation technique known as “indigenous yeast” fermentation and making consistently excellent wine. Why all of a sudden has this technique become a buzzword in the wine press and why have other winemakers recently begun experimenting with this technique? The trend Tenscher observes has been popularized by influential wine critics who are proponents of wines made with more natural, less interventionist techniques. Indigenous yeast fermentations fall into this category because the vineyard’s native yeast start the fermentation naturally in contrast to the common California, and in recent years European, practice of adding yeast to start the fermentation. To be fair, most winemakers using wild yeast are looking less at the marketing dividends and more at the potential for enhancing wine quality. This article will compare wild yeast fermentations with inoculated fermentations, how each affect quality and why some of California’s top winemakers use wild yeast and others do not. Fermentation is a vitally important stage in winemaking. The yeast not only convert sugar to alcohol but also produce esters and other compounds, which contribute to the wine’s fruit aromas. Extraction of flavor and color from the grape skins (for red wines) also occurs during fermentation. For larger production, less expensive wines, a yeast strain is chosen to get the job done as expediently as possible—converting all of the sugar to alcohol and freeing up the tank for the next load of crushed grapes. Some yeast produce a heavier sediment which settles more quickly after fermentation making racking and clarification easier. For smaller producers, varying the yeast strain as well as the temperature and duration (maceration) of fermentation can enhance the wine’s aromatic and flavor characteristics. The common practice in California is to add a sufficiently large dose of a single strain of yeast (Saccharomyces cerevisiae) to the grape juice to start the fermentation. A few commonly used strains are Prise de Mousse, Montrachet and Champagne. The yeast is selected for its ability to quickly (in a few hours) start the fermentation and to tolerate the increasing alcohol levels enabling it to ferment all of the sugar while producing minimal amounts of undesirable by-products such as volatile acidity and sulfides. Volatile acidity is acetic acid or vinegar. Sulfides are compounds, which at thresholds levels may be desirable but in higher concentrations smell like rubber or rotten eggs (hydrogen sulfide) or worse. Inoculated fermentations can, in certain circumstances, produce objectionable amounts of volatile acidity and/or sulfides and even worse “stuck” fermentations. Winemakers get nervous if for some reason the fermentation stops or before all the sugar has been consumed. A stuck fermentation is difficult to restart and dangerous because once the yeast stop growing, the protective layer of carbon dioxide is removed. The door is open for spoilage yeast and bacteria (Brettanomyces, lactobacillus and acetobactor) to consume the remaining sugar in turn producing vinegar, earthy, barnyard or sauerkraut aromas. An indigenous yeast fermentations starts by itself when wild yeast strains – originating in the vineyard—start fermenting. Wild yeast can take up to a week to begin the fermentation because their initial populations are small compared to an inoculated fermentation. But there is strenuous debate as to whether the wild yeast come in from the vineyard or are already present in the cellar on winemaking equipment. A proponent of the vineyard theory is Robert K. Mortimer, Professor emeritus of Molecular and Cell Biology at UC Berkeley who has worked closely with several California winemakers studying the role of yeast in natural fermentations. He and others have shown that Saccharomyces cerevisiae is on the grapes but only on about 1 in 1,000 berries. Saccharomyces cerevisiae is referred to as the “true” wine yeast because its alcohol tolerance enables it to ferment up to and beyond 13% alcohol. Also on these grapes are other species of wild yeast, bacteria and mold. Generally, Saccharomyces cerevisiae is the least prevalent of these microbial species. When the grapes are crushed, all of these organisms enter the fermentation, whether inoculated or non-inoculated. For the first one to three days of a natural fermentation, the wild yeast predominate. As alcohol levels reaches 3-4%, the wild yeast give way to the increasing numbers of alcohol tolerant Saccharomyces so that by two to five days this yeast predominates. At the end of a natural fermentation usually only Saccharomyces cerevisiae is present. Professor Mortimer has shown that there is a multiplicity of strains (as many as 16) of this yeast in such fermentations. Whereas in inoculated fermentations, Saccharomyces cerevisiae predominates from beginning to end because of the high level of inoculum. The end result of what also may be referred to as a sequential fermentation is a wine believed to have added texture and finesse. Proponents claim that red wines are lower in tannin. This extra degree of complexity is subtle and owes itself in part to the array of by-products from the different native yeast strains as well as the longer lag period prior to the start of fermentation. But there are situations when even devoted followers of wild yeast would opt for an inoculated fermentation. Rain at harvest washes off the native yeast, reducing their populations. 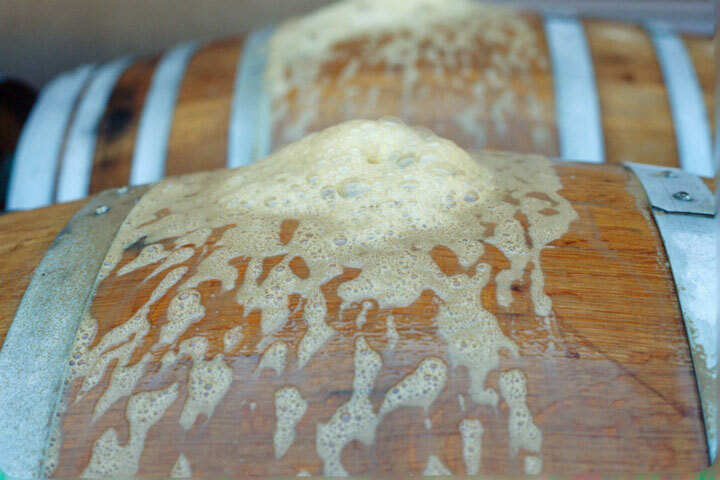 The ensuing rot contains bacteria and mold which can, during the longer lag phase of a native yeast fermentation, proliferate and ruin the wine. Large winery size is another deterrent to the use of wild yeast. The irregularities of natural fermentations require closer monitoring of individual barrels, which may be impractical on a large scale. Franciscan produces ‘Cuvee Sauvage’ its premium Chardonnay, with 100% wild yeast. Tenscher explains, “For us, wild yeast fermentations are sluggish getting going, then they may really rock ‘n roll or just poke along. You don’t have a highly predictable fermentation so each barrel stands a greater chance of being different. With the different yeast strains involved, we get a diversity of components that help us create a wine with more interest—different textural elements brought out by the longer fermentations in addition to desirable aromatic and flavor profiles.” Tenscher uses wild yeast for a small quantity of red wines, but gets different results, “We don’t find the effects as powerful in red wines as we see it in white wines. In a Bordeaux style blend it is not going to make a world of difference because the added maturation time and oak influence overwhelm the positive impact from the native yeast”. Williams of Frog’s Leap is a long-time user of wild yeast and feels that the risks Tenscher is worried about may be valid, but his experience has shown them to be overstated. He says, “You bring grapes into a winery and you’re faced with risks. I don’t think those risks are substantially increased by using natural yeast fermentations and that is 20 years experience. I don’t want to say that we’ve never had fermentation problems, that is not true, we have. But I think there may be some benefits to an overall program of using natural yeast that come with it—the wines are more harmonious, more knit and reflect their vineyard character more closely.” Williams adds that if the must is deficient in a nutrient required by the yeast, there will be problems regardless of the fermentation method used. For inoculated fermentations, the size of the inoculum which yeast manufacturers recommend adding is large enough to insure that the fermentation starts rapidly and is therefore dominated by this single strain. Adams inoculates with a considerably smaller dose of yeast and feels he derives some of the benefits of a wild yeast fermentation. The result is a longer, slower fermentation, giving a toehold for native yeast to have an influence on the fermentation. The attitude at Acacia Winery, according to former Winemaker, Dave Lattin, is to encourage wild yeast where possible through what is called a ‘cold soak.’ He explains, “We routinely inoculated 2-3 days after crushing so that we get a build up of wild yeast. Frequently, there will be some activity with those yeast, particularly if you don’t add sulfur. Three days later, we hit it with a yeast we know will ferment. If we’re dealing with a part of a vineyard that has never been particularly complex or has very aggressive tannin, then why not try an uninoculated fermentation to build in more softness and complexity, but I would never advocate going into it 100%, Lattin says. But he says the practice is different with their best vineyards, “with St. Clair and Beckstoffer, we attempt to let them go without inoculating. Sometimes they take off and sometimes we have to inoculate because nothing happens. These vineyards have low pH, high acidities and lots of tannins, which have inhibitory effects which make for a sound wild fermentation. On the other hand, there is another vineyard which produces high pH, low tannin fruit—you just look at it and it gets funky.” Lattin is referring to the fact that high pH’s leave a wine unprotected. During the longer start-up period for an uninoculated fermentation, the door is open for bacterial growth (acetobacter, lactobacillus) which can produce stinky aromas. Traditional Practices or “Man as Maker”? Bordeaux and much of Europe practice inoculated fermentations. The exceptions are some of the small estates in Burgundy and the Rhone who use native yeast in most years. For these smaller domaines, science and technology take a back seat to tradition, or ‘doing it how my father did it.’ While California winemakers have embraced many traditional French winemaking techniques, natural yeast fermentations have caught on only in the last ten years or so. One reason some feel is because graduates from the Department of Viticulture and Enology at UC Davis, while receiving what many consider to be the finest training in the world, are not trained in traditional winemaking. 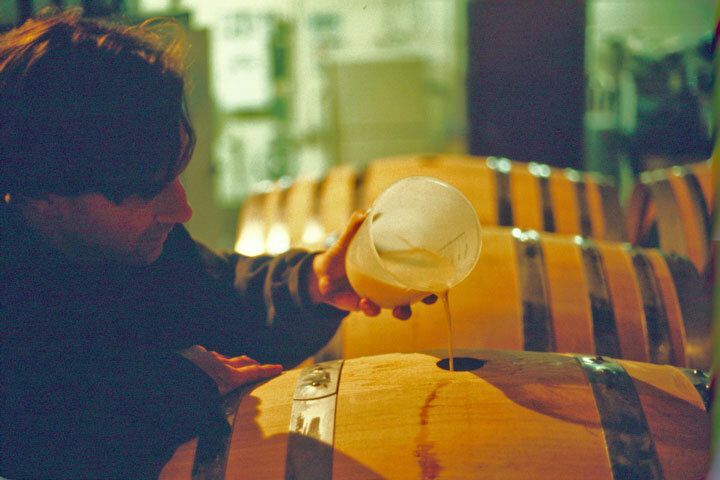 The Davis approach, based upon technological advances, reflects the belief that an inoculated fermentation—where the winemaker exerts greater control—is a more responsible approach to winemaking. Wild yeast is not the secret, indispensable answer to making great wine. Rather, it is a piece of the puzzle—one in a number of ways to develop complexity in wines, even if this added complexity is short-lived. This quality factor, coupled with the fact that the majority of winemakers feel these methods make their craft more interesting and challenging assures that the use of wild yeast will continue to grow in the production of super premium wines. By matching the right grape varieties to the right growing regions, winemakers will be working with high acid, low pH fruit, reducing the risks of wild yeast fermentations.